See my BEADIE PAGE, for basic instructions. Also see my Bible and Jewish Holiday Bead Projects Page. String 2 white beads. Double through. String on 4 white, 4 black, 1 white. With second cord double through the one white, 2 black THEN go back through the the first white bead of this row and continue through the next 2 black and next white. 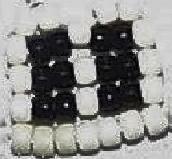 Start repeating pattern of white , 2 black, white, 2 black, white for all other rows. Ronin decided to try the variation mentioned on style 1 above. 3 1/2 feet of cord/ribbon. 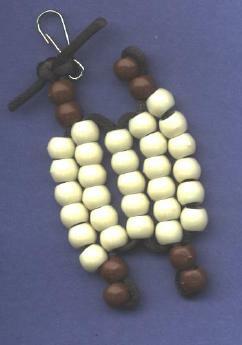 String on 6 cream beads, at each end string on 2 brown beads. Bring the cord around the first brown bead and into the first. repeat for the other end. 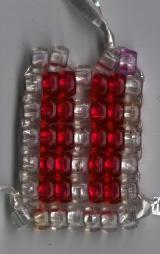 Add on a row of 6 cream beads. Row of 5 cream beads. Row of 6 cream beads adding two brown beads onto each end of this row. Back through the first brown bead on each side. Row of 6 cream beads. End so both cords are on one side. When finishing this row add lanyard clip and tie both ends together. Please let me know if anyone else has a Jewish Beadie they would like to share. To return to the top of this page. To return to Eileen's Original Jewish and Bible Beadie Patterns.